2013 will represent our fourth year in the ID Card Systems market as distributors for Evolis ID card printers – and it seems like yesterday! OK the daily news bulletins about the recession and financial crisis sounds consistently monotonous but that’s where the resemblance ends! Evolis is a very progressive company and we just love working with them! Despite the recession, they are growing in double digit figures and we’re growing with them! Why…because they innovate and the quality of their products reflects this. Every month they have some new announcement or other about PVC Card Printer innovation etc. So what’s new…. 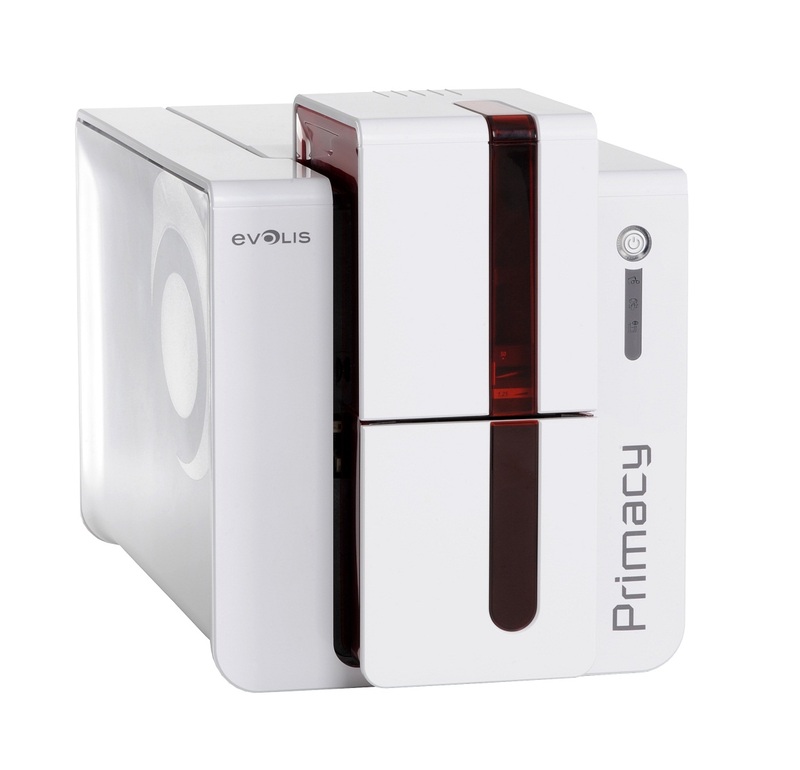 New Evolis Primacy is innovative and a good looker! The Evolis Primacy ID card Printer is the next generation in the line up of innovative printers. First of all, I’d like to commend Evolis on getting it right again – just like its high-volume cousin the Dualys and pebble models – the new Primacy printer offers a huge array of new features like a 100 input hopper and 100 card output hopper! Furthermore, the door on the output hopper is another nice feature on the Primacy. It helps to keep everything nice and tidy – Along with the front input/output hoppers, you also have a rear output hopper that holds 30 cards. The rear output hopper is especially useful for encoding jobs – your print job won’t stop if you happen to get a card in the batch with a bad mag strip. A scalable printer, that’s like lego! When buying a card printer, we always tend to look for the most feature rich printer at the best possible price. Of course that’s not always possible and we end up compromising on the very feature that we may need in the future. Well Evolis, found a great compromise and introduced a scalable printer where you can add features like double sided printing, encoding options at a later date. I love this feature as it allows our customers to build a printer to suit their needs now and have the comfort of knowing that they have also “future proofed” their ID technology for the future too! The Primacy id card printer boasts some pretty good numbers too – and are quite a bit faster than anything a generation previous. But looks were not sacrificed for print quality either and the resulting printed cards look fantastic when printed. Intelligent Ribbon Installation Configuration for easy of use! Evolis’ major change for this next generation of printers is the ribbon cartridge with an RFID chip. Although never a deal breaker on past models, it was a pain to have to set the ribbon type every time you wanted to change from color to monochrome or vise versa. The new Primacy and Zenius ID Card Printer models now make changing ribbons as simple as dropping it in and closing the lid. The RFID chip updates the driver immediately and you are good to go. Along with the new print cartridge, Evolis now offers its user friendly Premium Suite for Windows. This gives you helpful information such as cleaning cycles, percentage of ribbon left, and more. The Primacy ships with both USB and Ethernet connectivity for added user flexibility. And that is really the key to the Primacy, its overall flexibility. Even more impressive, the Primacy card printer is backed by a standard 3 year warranty. That is about the best warranty available standard on any printer in the industry. Just make sure you keep up on your cleaning cycles, or you’ll quickly have a print head that is no longer covered under the warranty. Do yourself a favor and order an extra Primacy cleaning kit just to keep everything covered! All in all, we love the New Primacy Printer. Call us today for a free demonstration.